A wonderful "Bonding Place!" As soon as you enter this home, you will feel like you are at home! Let the breathtaking view relax you. Turn on the fireplace and take a nice long nap on the cozy couch. After playing golf all day, traveling or wine tasting, enjoy a deep relaxation bubble bath then sink into the cozy bed and catch up on much needed good sleep! Wake up to birds chirping in the tranquil view. Meet the cute quail family that visits every morning. Open a cold one and play pool, ping pong or darts. How about a board game or read a good novel. Kitchen is equipped so you can cook your holiday meals! Watch Netflix from 3 tv's. Good WIFI. Enjoy your evening wine or cocktail hour and watch the breathtaking sunsets every evening. Step outside on the balcony from your bedroom. My family has been traveling to Arizona since 2004. We decided to get a vacation home for our family since staying in hotels was so uncomfortable for our kids. We wanted to make our home a nice experience for our family so they feel like they are at home while we are away. We want to share our home with you and your family so you can also have this wonderful experience! I love cooking a turkey and making special holiday meals when I travel! We enjoy all the activities around Prescott Valley and the weather is so nice here! We do day trips to Flagstaff to ski. Hike in breathtaking Sedona on the Red Mountains! Then have a wonderful dinner downtown. We enjoy touring Haunted Jerome and Art & Wine tasting. They have a once a month art event and the entire town comes out and keeps their stores open with bottomless wine and music! We also go to Scottsdale to see the museum and shop at the huge mall! My kids really love the Monsoon season! It's fun watching the lightening and thunder while drinking hot coco in the house! We love Prescott Valley because it's centrally located. We can go to spend the day in Sedona and come back and stay here because it's only an hour away. If you go to Sedona, on your way back to PV go check out Jerome and all the historical history there! They offer haunted tours, wine tasting, great little shops, historical Wild West Bars! It's really a fun place to visit! I want to try Haunted Hamburgers next time we go there. The view from Jerome to the valley is absolutely breathtaking! We can go to Scottsdale and Phoenix for the day and come back the same day because its also only an hour away. The weather is cooler here year round! If it's 117 degrees in Sedona or Phoenix it's only 85 or 90 degrees here! There are lakes, parks, wild life zoo, gorgeous scenery all around here! you can go to the mountains for a hike and picnic then go out to dinner downtown Prescott on Whisky Row. Prescott Valley is newer and growing! Check out the rock trails and explore! There is so much to see and do here. The list is endless! Enjoy watching the gorgeous sunsets from the rear balcony! Sweeping view from the master bedroom, guest bedroom and living room! Home is comfortably decorated and updated throughout! Game area includes pool table, ping pong, darts, board games & books! This house is smart house. The thermostat will learn how you like your temp and keep you comfortable! There are 2 exterior Ring light monitors for your safety and security (they are not monitored during your stay). They will light up if there is anything outside to alert you. I want my guests to feel safe and comfortable during their stay. The TV's are also linked so you can use Netflix, Pandora and more from each TV! toilet, combination tub/shower, Huge soaking tub! Beautiful updated bathroom! toilet, Cute powder room located near kitchen! Guest bathroom has a huge wonderful soaking tub! Master bathroom has huge walk in shower! 2 sinks, extra storage area for all your clothes! Fresh crisp white linens provided! 2 cars on driveway and street parking. RV parking! Converted into a game room! Pool Table, ping pong, sitting area, dart board! Enough white towels for all guests! Spacious open room with slider and windows with a view of the gorgeous sunsets! Spacious balcony with new BBQ and endless views! Perfect for entertaining!!! Nice stainless refrigerator with automatic Ice maker and filtered water! Extra dishes, glasses, silverware! Everything you need, like being at home! Fully stocked kitchen! Enough equipment and utensils to make a holiday feast! Extra dishes and silverware! Crock pot, dutch oven, turkey platter, roasting pan, butcher knives, toaster and more! Dining room has wonderful round table seats 6, 2 extra seats in kitchen, 4 more barstools at bar in wonderful big open room! Free Netflix, 3 flat screen TV's, Pandora, Free WIFI! Many new books on bookshelf! Located in garage! Pool table, ping pong and all the equipment! Dart board! Seating area. Some toys in twin bedroom. Expansive deck faces view! Recommended to watch Gorgeous Sunsets! The entrance was nice and inviting. We had to call the owner because she forgot to send us the code to the house. The house needs attention. There are cracked and broken tiles in the kitchen and bathroom. These were old broken tiles that had been put back in place. The window featured vertical blinds that would fall down if opened or closed. The refrigerator had a bad smell although it was very clean. The ice filter needed to be replaced. The best feature of the house was the quail family in the back yard. We stayed for 1 half of our rental contract. The initial repair work was for a cracked tile in the kitchen. It had a temporary fix with glue. The kitchen tile floor and to my surprise, the bathroom tile floor was also damaged so we replaced both of them. The window blades did get pulled off from the living room, master bedroom and the kids room. All were replaced new. I also replaced several other items that were found broken or missing. The filter in the refrigerator was new but we replaced it anyway due to your comment. We checked and there was no smell in the refrigerator. You stated on an email to me that you left early because you were "very home sick" and had "bad allergies" and you said "you no longer wanted to buy a home here." You told me it was not because of my house. You said my house was beautiful. I tried to call you back several times but your phone wouldn't take any calls. I found a 2nd phone # that your husband called me from to get the address to mail you something. When I my call finally went through to you, you answered the phone by screaming at me because you thought I was your realtor. I was very taken aback and concerned by this. You then apologized to me and told me you had a bad experience with your realtor. I said I was the owner of the vacation home and I explained that I was responding to help you with your door lock. You then said it didn't work. I walked you through how to open the door and it worked fine. You said you entered my house through the garage door. I also told you to not leave the house unlocked. You said you enjoyed the complimentary wine that I left for you. I asked how everything was and you said everything was fine and you loved the house. My contractor was scheduled to fix the floor after your stay. And I had new window blades but we had to wait for the house to vacant between guests to do the floor work. You were staying for the entire month and your phone did not accept any calls. **You were emailed the welcome book along with your own door code on 1/23/19. ** I received a copy of the email receipt I sent you. I helped you open the door because you couldn't figure out how to open it. We can't locate the Roku remote after your stay. We looked everywhere. So I had to order a new one. The garage door was found broken after your stay and I had to pay a garage door company to fix it. I turned away several other guests who wanted to stay at my house for this time because we accepted your reservation. 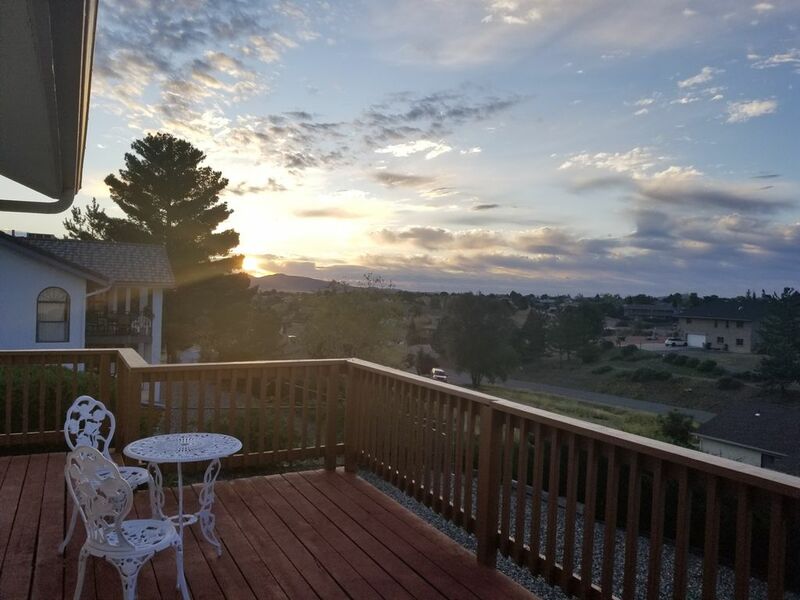 Excellent Property that I would definitely recommend for any stay in Prescott Valley, Prescott, and the surrounding area. Comfortable. Well Stocked House. TV, Cable, Internet, Game Room, Coffee Maker, Full Kitchen, Living Room, and 3 Bedrooms. The Deck off the back of the house was very nice to sit and relax on both with my morning coffee and at night when I sat watching the stars in the sky. I am looking forward to staying at this property again. Thank you for staying at The Eagle's Nest! We hope to see you again next time! We can't say enough good things about this house, it has absolutely everything that you might want or need for a relaxing vacation. We enjoyed morning coffee and evening wine on the balcony, and playing pool and darts at night. The furnishings and decor are very well done, and the kitchen is stocked with anything that you need. We would stay here again. home has a raised balcony in the back to sit outside in the afternoon and enjoy the view. Thank you so much your your nice review. I'm glad you liked our home and the view! We hope to see you again next time! Very relaxing, homey & inviting! An amazing getaway for all ages ! Extra charges will be added if utilities are used in excess.